Registration at 9:00 a.m. - Pick Up at 3:00 p.m. The goal of SMBC is to provide an enjoyable week of camp centered on God and the Bible. Our desire is to create an environment where everyone can grow spiritually and physically without worldly distractions. Everyone must comply with the following guidelines! ￼1. Campers shall participate in all planned activities (including but not limited to devotionals, classes, recreation, etc.). 2. Girls are not allowed on the boys' side. Boys are not allowed on the girls' side. 3. Campers will keep cabins & campgrounds clean. 4. Campers will dress modestly at all times (Short-shorts and tank tops with straps less than 3” wide are NOT allowed!). 5. Infirmary Supervisor will keep track of all medications, including over-the-counter types. Medications must be dispensed from ORIGINAL containers from the pharmacy, with dosage instructions. 6. Campers cannot go to their cabin without a counselor & must stay in their cabin after lights are out. 7. Directors are responsible for their session of camp. Campers will follow their rules and treat staff with respect. 8. Electronic entertainment devices (e.g., MP3 or DVD players, cell phones, radios, handheld games, etc. ), firearms, tobacco, drugs, axes, fireworks, and knives are not allowed at camp. 9. Campers must have the permission of the director & sign out before leaving camp. 10. Laundry facilities may only be used by counselors in an emergency. 11. Leave all personal valuables at home. 12. Harassment, intimidation and bullying will not be tolerated. Check in on Sunday is 2:00-4:00 EST (1:00-3:00 CDT). Registration is on a first come first served basis. Please preregister early to ensure your camper has a spot. Registrations will not be taken by phone. Pick up time varies for each week. Please inqure at registration or call camp directly at 1-812-849-3111. Bible, notebook, pencil, bedding, towels, toilet articles, swimsuit, week's supply of modest clothing, comfortable shoes (2 pair suggested), jacket, fan (1 only), flashlight, sunscreen, bug spray. Electronic entertainment devices (e.g., MP3 or DVD players, cell phones, radios, handheld games, etc. ), firearms, tobacco, drugs, axes, fireworks, & knives. Restrictions also apply to all visitors. What kind of activities will we do at camp? 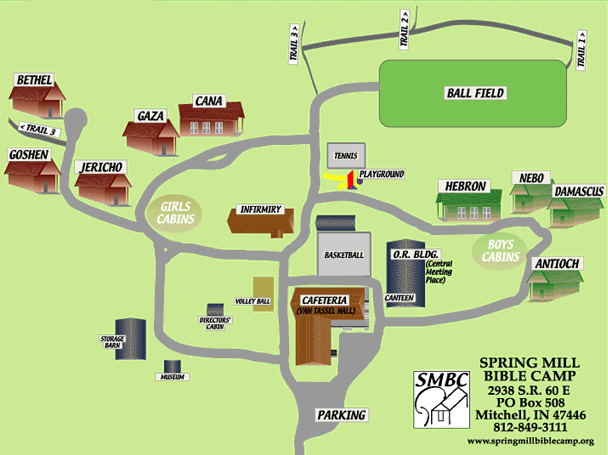 Activities are different every week, but campers should expect daily Bible classes, chapel, singing, campfires, games, hikes, and swimming (boys & girls alternate days). Day Camp is an introduction to camp for those who are too young to participate in a full week. Day campers will participate in many of the same activities as a normal week but only for the afternoon. Day campers should wear play clothes and shoes, and bring a pillow and a sheet.